Heat the vegetable oil in a wide pan over a medium heat. Add the onion, garlic, ginger and chilli and fry, stirring regularly, until the onion is soft and golden. Mix in the cumin, coriander and turmeric and continue to stir for about 3 minutes before adding the tomatoes. Fry briskly, stirring occasionally to ensure the tomatoes don't stick and burn. When the tomatoes form a thick paste that releases a little oil in the pan when a spoon is drawn through the mixture, stir in the garam masala and salt to taste. Cook for a further minute then mix in the chicken. Keep stirring until the chicken is sealed and coloured, then stir in the spinach, a handful at a time, adding more as it wilts. Stir in the crème fraîche. As soon as the mixture begins to bubble, reduce the heat and simmer very gently for about 17 minutes or until the chicken is tender. Under- or over-cooking will result in chewy chicken. Serve now, or cool and reheat when needed. 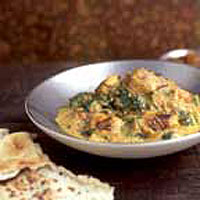 This is particularly good eaten with warm naans and a dish of mango chutney.